There is no such thing as blended-learning. Author Simon Paul AtkinsonPublished on September 30, 2011 October 11, 2011 4 Comments on There is no such thing as blended-learning. There is no such thing as blended-learning. Or rather there has never been anything except ‘blended’ learning. Of course we all know that, we’re just lazy with our language and as Orwell(1) said “…if thought corrupts language, language can also corrupt thought.” Maybe it’s worth thinking about the terminology we use. I have no problem with a conversation about the right blend, indeed I rather like the verb ‘blend’, it’s the noun ‘blended/ing’ I find problematic. Let’s stop talk about the ‘blended approach’ and describe instead our model of learning. Let’s agree on our underpinning theoretical structures (if you like that sort of thing), identify our context and that of our learners (culture, expectations, destinations, prior experience, infrastructure), and let’s describe our model. What we have in the contemporary ‘blended’ debate is a healthy concern with what students’ do, and where, how and when they do it. Rather than teaching our one-hour lecture and our two our seminar and despatching students’ into the dark dusty stacks or the ‘short-term loan’ mêlée, we now seek to engineer the ‘blend’ of approaches we want them to take. The scrap for the library carousel and scouring the desks of the studious for the only copy of the ‘reference-only’ gem has now been replaced by a broader concern for the ‘design’ of the students’ learning. We blended twenty years ago and we blend today, only the context has changed. This is a good thing. So why don't we call it that, why don't we call it ‘our learning model’? Since here is so much pressure on Universities to differentiate themselves why don't we seek to develop, articulate, refine and promote the Massey Learning Model, the Athabasca Learning Model, the Wisconsin Learning Model. ‘Blended’, like many terms in education, has been in vogue and now risks being taken for granted and misused. Alternative terminology also has its supporters; ‘mixed-mode’ and ‘hybrid’ are also used synonymously. 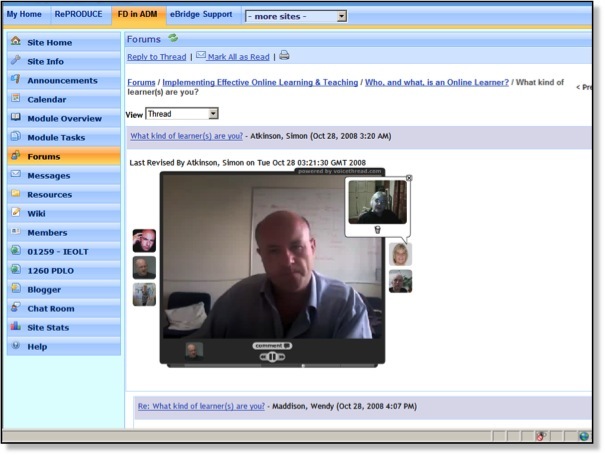 The most common conception of blended learning is one in which there is a combination of face to face, real-time, physically present, teaching and computer-mediated, essentially online, activity. The term has come to imply an articulated and integrated instructional strategy. The term blended is often used to imply something more than the evolution of digital materials ‘supplementing’ face-to-face instruction, rather it implies that each ‘mode’ can serve a student’s learning in different ways. In practice this might mean that a two-hour lecture and a two-hour seminar become a web based lecture, a face-to-face seminar and several web based activities, allowing more time for contributions, more time for voices to be heard. The contemporary argument is often simply maths. In a class of 40 where one would hope to have a thoughtful 10-15 minute contribution from each student, a seminar would need to be 8 -10 hours long. Online that same reflective and expressive opportunity is unbounded by class-time. There are many reasons to reconsider the reliance on face-to-face instruction. Participation, the opportunity to contribute, is one. But there are also opportunities for content to be paused, reviewed, annotated, questioned, spliced and shared in ways that live synchronous face-to-face contact cannot be. Media-rich course content, video and audio, interactive resources, formative assessments, all serve to allow the student to choose not just when, but also where, to study. The ‘where’ question then also gives rise to the other popular motif amongst University leaders, mobile learning. The reason it is so difficult to establish what the right ‘blend’ is, is simply because the context of the learning determines the nature of the blend. The students’ context establishes what can and can’t be done in a specific mode, what time parameters exist, what technology restrictions and what assessment evidence is ultimately required. Perhaps the biggest argument in favour of a blended approach (20 years ago and today) is simply that it requires engagement. Managing to access content and activities, participate appropriately and incrementally develop a portfolio of formative assessment towards a final summative goal, requires, self-management, discipline, at least some digital literacy today, and some motivation. Turning up and sitting in class is not hugely onerous (although arguably it demonstrates time-keeping). So if you’re an institution considering the ‘Blend’, I’d like to offer a suggestion. Don’t. Instead consider the nature of your context (past-present-future) and articulate the learning model around which your exemptions and exceptions will develop, articulate a learning model to rally staff to a shared concept of learning (believe me, ‘blended’ won’t excite them) and articulate a model that learners will say “I recognise that, that’s my concept of myself as a learner, I’ll go there”. Take a diagnostic model (here’s one I prepared earlier…) and define your own unique model of learning (better still invite me to come and work with you on it), and I guarantee you will be blending (verb) but you won't have to try and sell the stillborn ‘blend’ (noun). Next article:Which Universities will shape the learning spaces of the future? Well that was enough good thinking to add a feed to my read. This resonates " “I recognise that, that’s my concept of myself as a learner, I’ll go there”. to me, once economies of enrolment scale are reached, this response could lead to an amorphous digital beige. Everyman offerings of "our model" will permeate the marketing efforts of society's micro-QA edu-dispeners, formerly known as aggregated full service tertiary institutes. If accreditation value is allowed to shift that is. Agility, to articulate their pinned down lighthouse learning, will attract and reflect each hub. Success here will ultimately distinguish institutes that thrive. The blending (verb) in culinary; fresh ingredients, refined, exquisite, intense, not blend (noun) all you can eat; bland, artificial additives, cheap(er), indistinguishable. These combinations, adjudged by cultural stickiness,(float and rank) will further sort the compelling must have dining experience or just another buffet that does the job.